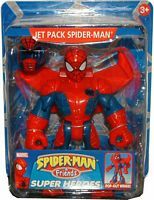 Description Of Item: Spider-Man & Friends are superheroes that use their powers in positive and constructive ways to aid those in need. They're designed to hold the interest of pre-schoolers and to be held by pre-schoolers. Bigger bodies and feet allow them to stand up to anything a pre-schooler can dish out. And larger accessories, like interchangeable backpacks, let your pre-schooler take part in adventures that stretch the imagination!